Bekonscot.. A complete blast for the past! Now, this is a place of shear childhood magic, and I've not been here since I was about 5 years old! So 24 years later (god I feel old!) I took my god son and family to see the wonders that is Bekonscot Model Village. It really is quite an unusual place. Takes you right back to the 30's, and has some incredible detail, but what was most fantastic to see that is still looks so new! A fantastic day ou, the kids (Thomas and Hannah) seemed to love it, and the good weather was a plus. I'll put more photos up on my gallery in due course. The really noticable areas were the churches complete with singing choirs and church bells, the house that is on fire with real smoke and firemen putting it out, and the airport with classic planes with working propellers etc... oh... and, of course, it just wouldn't be right not to mention the incredible trains that are buzzing around the entire "village". A complete working train network of steam engines. Just amazing to see that level of detail. It's great to see it still running after all this time. These types of places are getting fewer and far between. This is the O2 XDA Trion. In a nutshell, it is a Windows Mobile PDA device with phone features. This is my current phone, and have been using it for about 3 months I think. I actually obtained it on the very day O2 released the phone, as it had some real benefits over the XDA Mini-S which I was using before. As I mentioned in the XDA Mini-S post, one thing that I found really fustrating is that the phone had everything it needed except a good CPU to makes things speed along. Instead it was fustrating too much of the time waiting for it to perform simple operations that I needed. This is where the XDA Trion was a beaming ray of light, as it had all the real benefits of the Mini-S, such as the sliding Qwerty keyboard and the simple fact that it beautifully combines the Windows PDA and the phone into one nice, neat package, but on top of this it has a 400MHz processor instead of a 200MHz, and the inbuilt memory seems to be slightly faster. That makes it pretty much twice as fast, and it is very apparent. Once I received the phone I was pleased to see that it was a full 3G phone (faster over the air data connection) so that I could syncronise with my MS Exchange server faster at times that WiFi or USB connectivity wasn't available, and also meant that you could make video calls.. but like most people I know.. no one makes video calls.. I did one as a test and thats about it. It still had WiFi access like the Mini-S (which I use a lot whilst lying in bed catching up with emails etc) and Bluetooth which I use all the time for my bluetooth headsets. So the whole thing seemed to be a big plus all round, hence, not even a hesitation to get it as soon as I was up for an upgrade and it was available. So here are my opinion on the Pro's and Con's. Bare in mind these are my opinions and will only be appropriate for those that use phones in the manor as I do. Standard USB connection on the phone means I can share the same cables and power chargers as many other devices such as navigation systems and digital cameras. It connects to the computer and charges using the same connection. Means less clutter and less hassle. 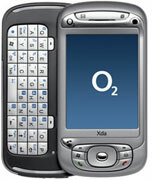 New update from O2 upgrades the device to Windows Mobile 6. The latest version of Windows for the PDA. Possibly slightly faster and smoother than the previous version. Functional wise I haven't seen much benefit. Qwerty keyboard makes writing text messages and emails a dream. Thumb pad because of the small keys, but very quick and easy to use. Microsoft Voice Command compatible. As with most Windows phone devices, but this voice recognition software I use ALL the time. Bluetooth headset quality seems to be a lot better than the Mini-S. That being said, see Cons..
Good battery life. I may not live on the phone, but even when i use it a lot, the battery will happily last several days which is more than adequate. Sleak phone. Its really slim and fits into the hand without feeling like you are holding a brick to your ear. Touch screen like most PDA phones, but I don't want to take it for granted. Hardly any Cons. This phone really is a beaty in the inside and outside. It's a windows device so there is lots of extra products you can install. The fast processor makes them additionally good in the experience factor. I use Spd Plus and Spd Mobile Shell (for very useful system features and usability) and, of course, Microsoft Voice Commander. Latest version of Skype doesn't support this phone (which I use Skype a lot for SkypeIn and SkypeOut). I did get an older version which did work, but was annoying. Voice Command does not work over bluetooth devices. This is incredibly annoying and my biggest gripe. Handsfree over bluetooth is important and not being able to use my favourite voice recognition software was a real pain in the arse. I have downloaded a sort of patch that semi-fixes it, but its still not quite right. Difficult finding a phone case I like. Weird con, but its important to have a case for a device like this. A new leather look one comes with it, but its nice to see the screen in the case which this one doesn't. So I got another which also has a belt clip and car holder which easy snap on and off for the both, but I still have to take the phone out to do some things as in the case its not quite confortable enough, and it adds quite a lot of size to this sleak phone. No headphone socket. I can get an adapter, but thats more clutter in my books. Everything goes through the USB port, which is a Pro, but somethings should be left on their own. I'm a speed junky. Even though this is much faster than the Mini-S, I want more speed! Esspecially ActiveSync to an exchange server, as that can, on the odd occasion, really hammer the CPU and lock everything else up.